NEW YORK (AP) — For a fundamentally nerdy subject, net neutrality is pushing a lot of political buttons. The latest salvo is over a California law that restores a ban on cable, wireless and other broadband providers from impeding people's ability to use their favorite apps and services. The federal government had rescinded that ban, and the Trump administration is seeking to block California's effort as an imposition on federal prerogatives. Though net neutrality started off more than a decade ago as an insight into how to make networks work most efficiently, it has taken on much larger social and political dimensions lately. The issue has emerged as an anti-monopoly rallying point and even a focus for "resistance" to the Trump administration. "Any time the cable companies and the Trump administration are on one side, it looks good for companies to be on the other side," Boston Law School professor Daniel Lyons said. But the idea hasn't always been political or partisan. Net neutrality traces back to an engineering maxim called the "end-to-end principle," a self-regulating network that put control in the hands of end users rather than a central authority. Traditional cable-TV services, for instance, required special equipment and controlled what channels are shown on TV. With an end-to-end network like the internet, the types of equipment, apps, articles and video services permitted are limited only to imagination. And the internet subsequently grew like nobody's business — largely because it wasn't anyone's business. But as internet use expanded, so did the power of the big companies that offer internet service to the masses. It became clear that they could, and sometimes would, restrict what people did. The Associated Press found in 2007 that Comcast was blocking or slowing down some file-sharing. AT&T blocked Skype and other internet-calling services on the iPhone until 2009. Law professor Tim Wu, now at Columbia University, coined the term "net neutrality" in 2003 to argue for government rules that would prevent big internet providers from discriminating against technology and services that clashed with other aspects of their business. Allowing such discrimination, he reasoned, would choke off innovation. Big telecommunications companies, on the other hand, argue that they should be able to control the pipes they built and owned. The Federal Communications Commission subscribed to the principle of net neutrality for over a decade and enshrined that as specific rules in 2015 under chairman Tom Wheeler, an Obama appointee. 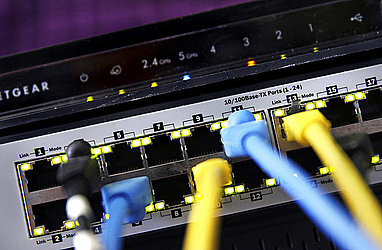 Among the rules: Broadband companies couldn't block websites and apps of their choosing. Nor could they charge Netflix and other video services extra to reach viewers more smoothly. Once President Donald Trump took office, net neutrality became one of his first targets as part of broader government deregulation. The FCC chairman he appointed, Ajit Pai, made rollback a top priority. And thus net neutrality became increasingly political. As a vote loomed for months, the once-obscure concept was debated endlessly on talk shows and online chats. Big-time Hollywood producer Shonda Rhimes tweeted a link to a story about saving net-neutrality on her lifestyle website. Actor Mark Ruffalo urged people to contact members of Congress by tweeting, "Long live cute dog videos on YouTube! #RIPinternet." The debate created strange bedfellows: Support for net neutrality comes from many of the same people who are also critical of the data-sucking tech giants who benefit from it. Yet on net neutrality, these tech companies got to be the "good guy," siding on the side of the younger "digital first" generation and consumer groups calling for more protection. No matter that these companies are keeping their own business interests at heart, as a net-neutrality rollback could mean higher costs for access to the "pipes." Politicians glommed on to the debate to appear consumer friendly. "No politician will ever lose votes by supporting net neutrality," said Gus Hurwitz, law professor at the University of Nebraska and a member of the conservative group The Federalist Society. "It's an ill-defined term that voters don't really understand other than that it is a scary concept they know they don't want to lose." Meanwhile, ISPs haven't done themselves any favors in appealing to the consumer. They've long had a reputation for bad service and high prices. Unlike the high-profile support for net neutrality, the opposition was limited to behind-the-scenes lobbying. Nonetheless, the FCC rolled back the net-neutrality rules last December on a 3-2 party-line vote. The decision took effect in June. On Monday, the Supreme Court declined to hear appeals from the broadband industry to strike down a lower court ruling in 2016 that was in favor of net neutrality. That effectively shut down an appeal that had already become largely moot when the FCC rolled back the rules. But in other arenas the fight is likely to drag on. Several tech companies including Mozilla and Vimeo are challenging the FCC's rollback decision in a federal appeals court. That's separate from the challenge to the California law, which is on hold until the tech companies' lawsuit is resolved. Oral arguments in the tech companies' case are expected in February. Oregon, Washington and Vermont have also approved legislation related to net neutrality. And a Democratic takeover of the House in Tuesday's midterm elections could revive efforts to enact net neutrality into federal law, though Trump would likely veto any such attempts. "Net neutrality is only the fifth round of a 12-round boxing match," Wedbush Securities Managing Director Dan Ives said.